It brings me great pleasure tell you that with your help we raised $145 from our fundraiser on November 19. All of the money we raised is donated directly to the DC DPhiE team for the Great Strides Walk in May. In turn, the contributions are donated directly to the Cystic Fibrosis Foundation. Thank you to everyone who was able to make it to the fundraiser, it was great to see both familiar faces and new faces in the crowd. Please mark your calendars for Thursday, April 30th for our next fundraiser for the Great Strides walk. Until May contributions are accepted to the DC DPhiE Team for the 2015 Great Strides walk. Follow the link below and make a contribution to our Great Strides team! Cystic fibrosis (CF) is a life-threatening genetic disease that primarily affects the lungs and digestive system. An estimated 30,000 children and adults in the United States (70,000 worldwide) have CF. To learn more, visit www.cff.org. Thanks again to everyone who came out to our event! Please join our team in the Leukemia Lymphoma Society’s Light the Night walk in Washington, DC on October 18th! Following our New and Prospective Member event that afternoon, we will be heading downtown to participate in this truly amazing event for cancer. Register to walk with us and feel free to register with friends, family or whomever you would like. If you cannot join us that day, please consider donating to our team so we can reach our goal! To register and donate follow this link. If you have any questions, please don’t hesitate to reach out to us. Membership in Delta Phi Epsilon starts in college, but it truly lasts a lifetime. As alumnae leave college and pursue careers around the world, they receive continued support from their sisters and alumnae groups. You will be able to find more information about who we are, our events and how to stay involved with DPhiE on this website. Delta Phi Epsilon Alumnae Association membership provides tools for networking and helps sorority alumnae to feel at home no matter where their lives may take them. As an added enhancement to alumnae membership, we focus on the 5 C’s of alumnae engagement, much like the 5 S’s, and plan events to enrich our lives in these areas: Culture, Character, Civic, Connections and Career. This program offers experiences to alumnae sisters that are relevant to your diverse lifestyles while allowing you to prepare for today’s world by developing social consciousness, providing continuous development and achievement, acting for the greater good and re specting our heritage. You can find more information on the 5 C’s on Alumnae Pearl Program page. We host three events each month at various locations throughout the DC metro area, and are always open to suggestions for new locations and types of events to host. These include a monthly brunch, held the second week of each month, a monthly happy hour, held the fourth week of each month, and a third event, which aligns with one of our “5 C’s,” and varies monthly. 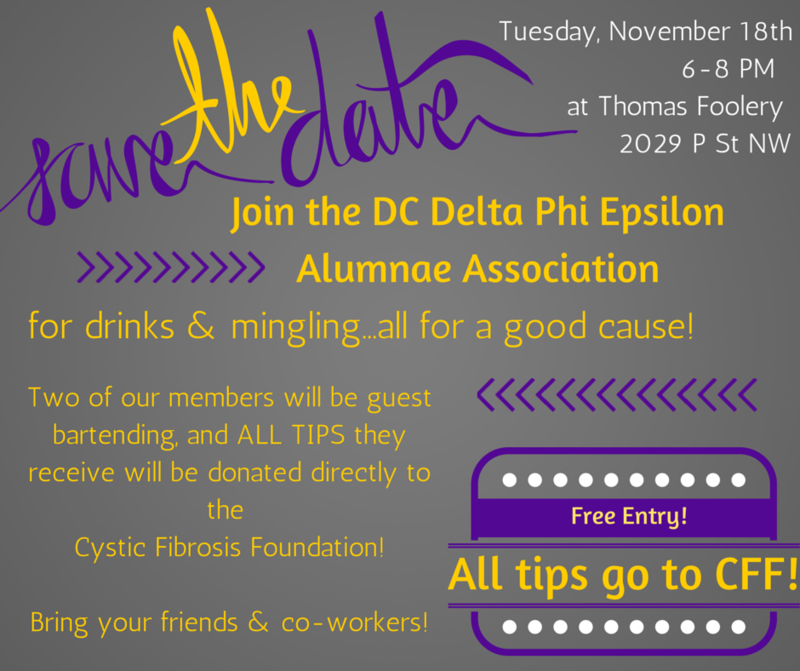 We are excited to expand and meet other Delta Phi Epsilon alums in the DC – Maryland – Virginia Area! We want to encourage all Delta Phi Epsilon alumnae that live in the area to contact us to join, even if you are not an alum from a nearby chapter! 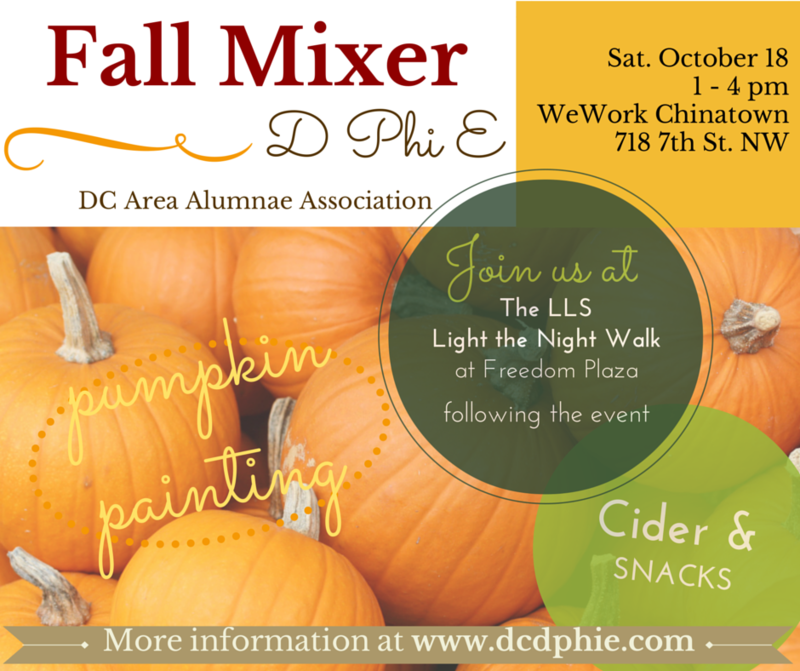 The DC AA is a great way to meet new friends, network, and have some fun, while continuing to uphold our values as a lifetime sister. Check out our website, join our Facebook and LinkedIn groups, and please don’t hesitate to reach out to our Leadership Team if you have any questions. Membership has its perks! Take a look at our “Join Us!” page above to find out more about becoming a member. If you decide that membership isn’t for you, please feel free to still get in touch, connect with us and come to events. If you are looking for a way to get involved with a great group of diverse women of all ages, are new to the area, or are hoping to reconnect with our sororal values, this is a great organization for you. We encourage you to come to any of our events – bring a friend, bring a sister, and bring your enthusiasm! So, spread the word, and we hope to see you at one of our events soon!